You need a vacation? The winter has come and you are home? 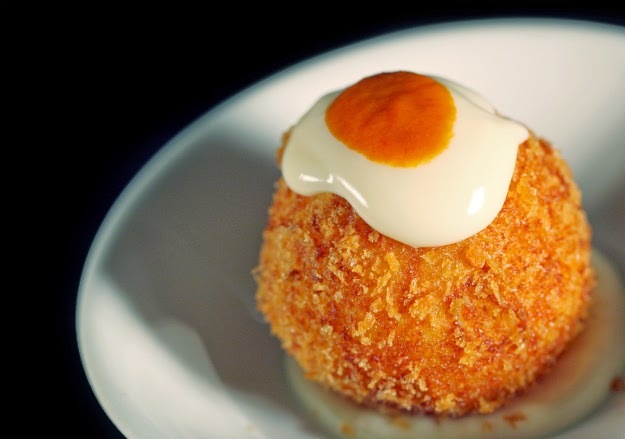 Here is a typical Catalan recipe that will make you taste Spain before going on holidays! 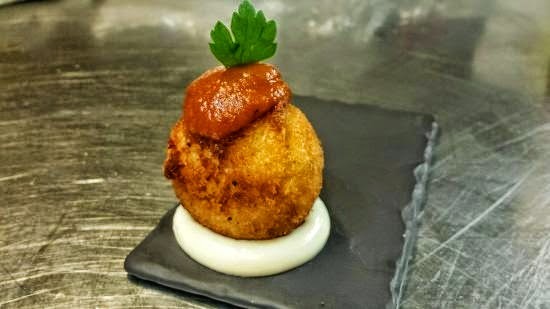 For those who do not know, the "bomba" is a meat and potato ball going breaded and accompanied by garlic and a typical sauce of Catalonia. The "bomba" was born in Barceloneta, a fishing neighborhood of Barcelona, near the beach. 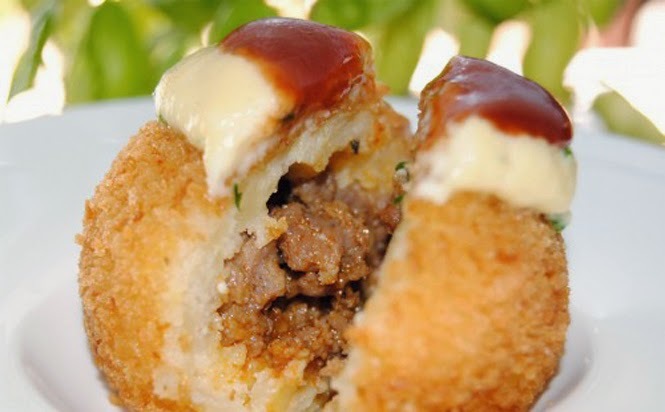 The recipe of the bomb is a secret, we never could coax the wonderful recipe to the famous tavern "la coba fumada... but today we will give you the recipe that is closest to the actual taste of the tradicional "bomba". We cleaned the potatoes well with warm water, rubbing order to extract all the earth, we put whole, unpeeled, in a pot with water to cover. The boil until well tender, it took about 30 minutes. Once cooked, drain them of water and let cool. As long as we make the sauce, chop the onion and garlic finite well, we put it to fry in the breadcrumb over medium heat with a little oil, stirring from time to time so we do not burn. -Once Well pochadita onion with garlic, when we see it is OK soft and beginning to catch a golden brown color, we add the minced meat and stir well, we are going to cook over medium heat, with the onion and garlic until it's well done, it took about 10 minutes more or less. -We peel the potatoes and put them in a bowl, add the fried meat and mix well with hands, chafando potato, until we have a homogeneous mixture of fried meat and potatoes. -The're Putting on a baking sheet and put it in the freezer for 20 minutes. -Then We took them out and just bowling, with this little trick bombs caught consistency and we can give a more perfect round shape. -Batimos los dos huevos y procedemos a rebozar las bombas: las pasamos primero por huevo, luego por pan rallado, otra vez por huevo y otra vez por pan rallado. Esto lo hacemos así porque si no cuando las friamos se nos van a abrir. -Calentamos una sartén con abundante aceite y cuando esté a unos 160-180ºC, freímos las bombas girándolas para que se doren por ambos lados. -Las vamos colocando en una bandeja con papel de cocina para que absorba el exceso de aceite. -Las servimos acompañadas de all i oli y salsa brava. - We beat the two eggs and proceed to batter pumps: the spent first in egg, then in bread crumbs, egg again and again by breadcrumbs. We do so because if not when are we going to friamos open. - We warm up a pan with plenty of oil and when about 160-180 °, fry the pump by turning to brown on both sides. -The're Putting on a tray with paper towels to absorb excess oil. -The Serve accompanied by garlic mayonnaise and salsa.